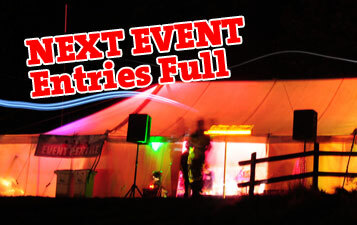 This year’s Apex Overnight Challenge has sold out in record time. After opening entries early on Sunday morning all 80 places were claimed by the middle of Monday evening. To fill an event in just 36 hours is completely unprecedented. There were more than 15,000 hits on the website on Sunday alone. First a huge congratulations to all those teams that managed to secure their place in the competition. It’s going to be a great weekend and we’re looking forward to seeing you all on April 9th. It was the first time we had tried out our new and improved entry system that allows teams to sign up and pay for their places using a debit or credit card online and we’re really pleased so many teams decided to do this. It makes things much quicker and simpler for teams to enter. We were running this alongside our old system of allowing teams to pay by cheque if they wanted to. The demand for places took us completely by surprise and unfortunately it proved to be impossible to get a cheque posted to Apex HQ before the entries automatically closed as teams paying by credit and debit card signed up. By opening entries on a Sunday, when there are no Royal Mail collections, we accidentally created a system where it effectively became impossible to enter by cheque. We’re really sorry this happened and have decided, on this occasion, we need to do something to put the situation right. We’re pleased to announce that any teams which entered on Sunday or Monday and got their cheques in the post by the end of Monday WILL still get a place in this year’s Apex Overnight Challenge. It doesn’t matter when they arrive at Apex HQ this week, they will still be processed. But the cut-off point is that the cheque must have been sent by the last post on Monday evening, according to the Royal Mail postmark on the envelope. Sadly we realise that there will still be some teams who are disappointed because they haven’t got a place in our next event. For that we’re sorry and we hope it won’t put you off entering our other events. In the future there will be just one entry system and as the majority of teams are now happy to pay using our online payment system, this will be the only system in use. In the meantime, if you have got your place in the event confirmed, take some time to read through the rest of the details about the event on the website. We’ll be releasing more details about the weekend over the next few weeks including your chance to suggest ideas of activities you’d like to see included. Join the adventure! More hoodies on their way! Event DVDs - Available Immediately!